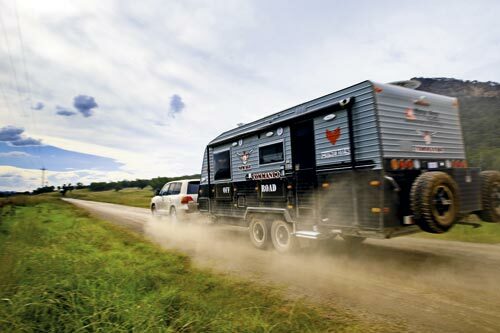 New Age Caravans makes no bones about the Commando 20 Series’ offroad prowess. “Like the name suggests, this caravan is built tough and can be taken on-road, offroad and down any beaten track,” the company declares. We decided to put this bold claim to the test as part of our shootout between the 200 Series LandCruiser and 5.6L Patrol. Hitching the Commando behind the ’Cruiser, we ventured into the Blue Mountains in search of the deeply corrugated side tracks that lead to this region’s many lookout areas and campsites. 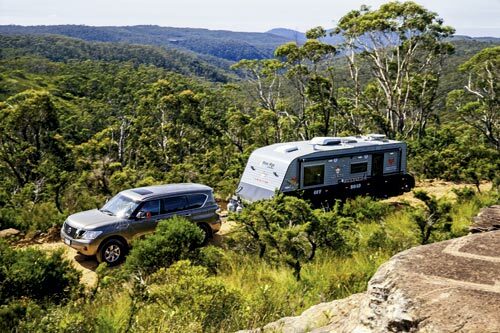 At $108,990 as shown from Sydney RV Centre, and with sophisticated electronics in its rucksack and armour plating just about everywhere, this caravan comes fully-optioned for adventure. 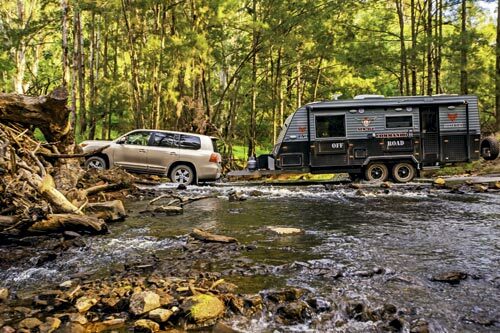 Spending $100K-plus would represent a major investment in your touring lifestyle, that’s for sure. But if you want a caravan with the whole kit and caboodle and then some, which is as structurally sound as its names suggests, the Commando deserves your attention. 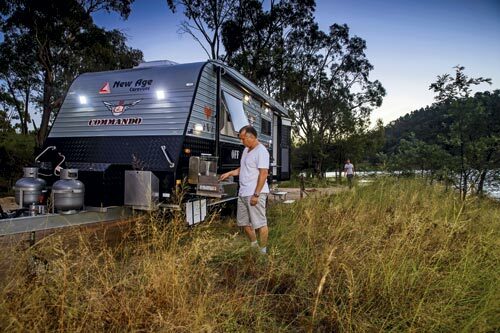 New Age Caravans is based in Campbellfield, Vic, and appears to be going great guns. 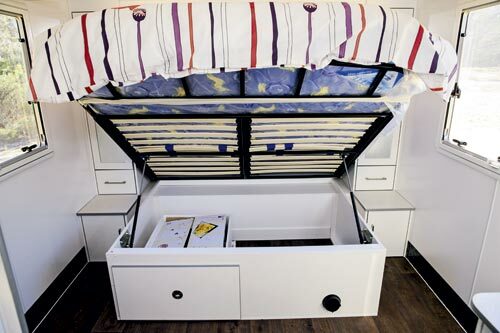 Last year, the company built around 800 vans and increased its staff number by 40 per cent. By the time we go to print, New Age will have moved into a new, larger factory to accommodate its growth. New Age’s origins, though, lie in building frames for various caravan manufacturers, setting up shop in 2004. 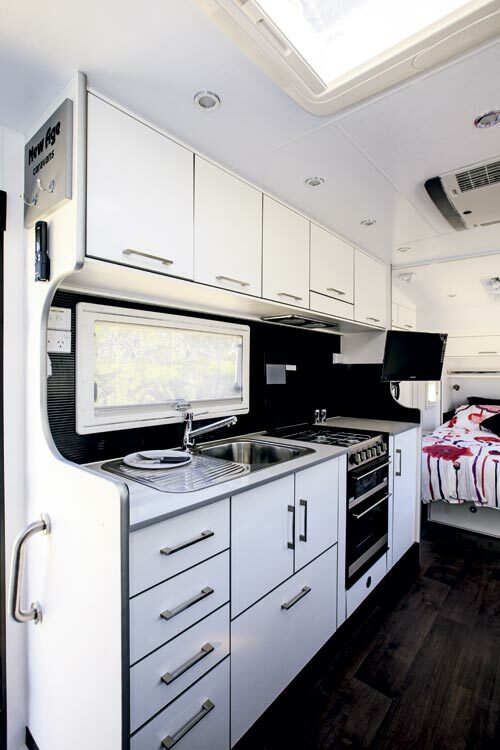 In 2009, the GFC forced the firm to look for new ways to stay in business – branching into caravan manufacturing (as opposed to building just van frames) was the logical move, and a van called the New Age Little Joey hit Australian roads, its CNC-cut ply furniture giving it a different interior look and precision to just about anything else on the market at the time. The Commando has a purposeful stance on the road. The serious intent of this caravan starts at the drawbar. There’s a substantial checkerplate storage box on the A-frame. Now, it seems to me that New Age has deliberately kept the unladen ball weight quite light at 140kg, knowing that when the box is loaded up, that weight could nudge 200kg. 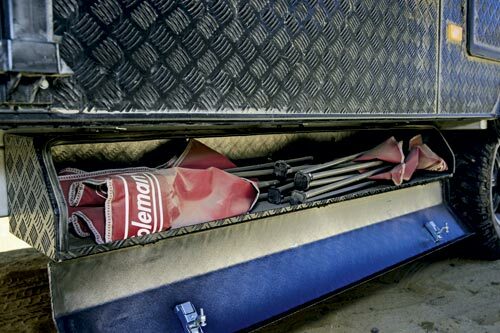 We tested it mostly unladen and found it perfectly stable on the ball and have no reason to believe that a heavier ball weight – such as when the box is loaded up – would change things. This is a well-balanced rig. Remember what I said about the Commando’s extensive armour? Well, it’s evident at the drawbar, with the vertical gas line and regulator hidden neatly behind checkerplate. There’s also a couple of jerry can holders, dual-clamp jockey wheel, and Hitchmaster D035 coupling, one of the best all-terrain hitches on the market. As we negotiated steep, gravel embankments, I was glad to have this excellent item on board. I also loved the dual LED spotlights mounted to the front of the van – we found them especially handy when unhitching at night. The central theme of this review is one of defence. 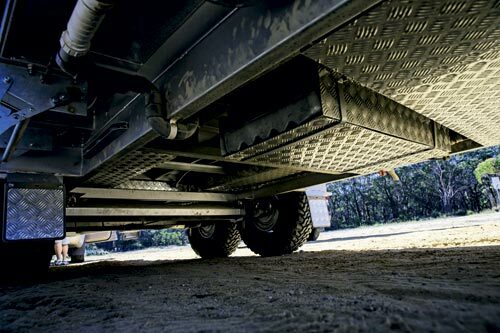 The Commando’s protection from road debris or worse extends beyond the A-frame gas lines. Almost everywhere that counts, New Age has fitted a checkerplate guard to keep the rig’s vital components safe. Underneath, you’ll find acres of checkerplate and anything that isn’t protected is tucked high in the chassis wells. The supply line from the water tank to the A-frame tap is totally protected. It’s this sort of detail that gives one confidence in the van. On the offside, you’ll find a large, gal-lined tunnel boot. It doesn’t go right through because the nearside-accessible slide-out barbecue takes up a portion of the space. Never fear, though: there’s heaps of other external storage options on offer, with slimline bins secured either side of the chassis. These bins are great for camp chairs, etc., but we did find the lids’ hinges – essentially just a couple of pop rivets – weren’t entirely sufficient for touring on corrugated tracks. They held during our test, but the rivets on one lid looked a little worse for wear after our trip into the old mining town of Newnes. 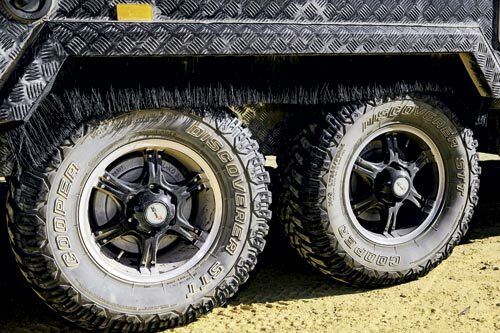 The Commando rides on Cooper Discoverer STT tyres on black alloy wheels, and Al-Ko’s torsion bar suspension which, I have to say, deftly handled some fairly gruesome terrain, smoothing what might have been an otherwise very bumpy ride for the caravan. The van also gets Al-Ko Electronic Stability Control. The external features list is extensive: offside shower, town water connection point, offside track for annexe or shade, LED lights everywhere, a solar panel on the roof, rear-mounted Cooper spare tyres and sizeable checkerplate storage bin… shall I go on? Okay: reversing camera, two fold-down picnic tables on the nearside, an Alden satellite dish, and external TV mounting point. The Commando commands respect inside as well as out. The attention to detail is very good – up there with the best of them – with CNC-cut ply cabinetry that lines up perfectly. It feels as though the quality of finish is equal to the rig’s price tag. The furniture is reinforced and bolted to the floor and/or frame and roof, too, so it should hold together during your offroad travels. It did during ours, at least. The technology in this caravan is all 21st century stuff. A VAST-certified HDMI satellite set-top box, along with the Alden satellite control, lives in one of the many overhead lockers in the kitchen. There’s a Jack electronic antenna along with a flatscreen telly in the bedroom. All of this means that wherever you are in the country, more or less, you won’t be without the idiot box. There are 12V powerpoints seemingly everywhere, probably more than I’ve seen in any other caravan: one in each bedroom wardrobe, one behind the offside dinette, one in the entrance, a couple in the locker with the VAST set-top box. So if your phone runs out of battery power when you’re on the road, it’s your own fault! The leather-upholstered dinette comes with a tri-fold table and snap-up footrests. 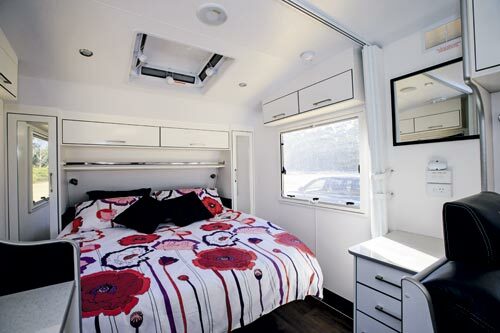 A twin-outlet diesel Eberspacher space heater is fitted beneath one lounge, while the Shurflo water pump is beneath the other, so there’s little true storage space on offer here, but there’s plenty elsewhere to compensate, such as the lockers above, though one is home to the ‘nerve centre’ of the caravan. In this locker, New Age has fitted a Projecta 35A seven-stage battery charger, 12/24V 20A solar controller, the Breaksafe unit and more. 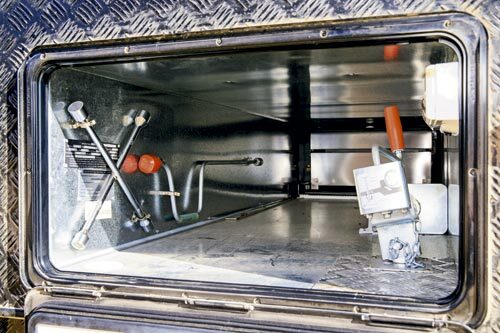 In a confined space, such electrical componentry is likely to build up heat, so New Age has fitted a 12V fan and ventilation hatch – a good move. 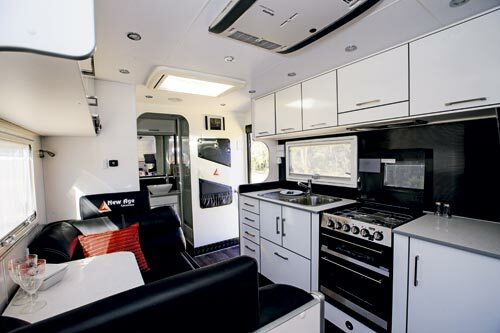 Immediately below, the Commando gets a Fusion sound system and iPod dock, connected to the two internal and two external DNA speakers. In the kitchen, you will find a huge drawer for pots, cupboards of various sizes, more drawers and plenty of overhead lockers. There’s a Thetford Caprice MkIII cooktop with griller and oven, and a workable amount of bench space. 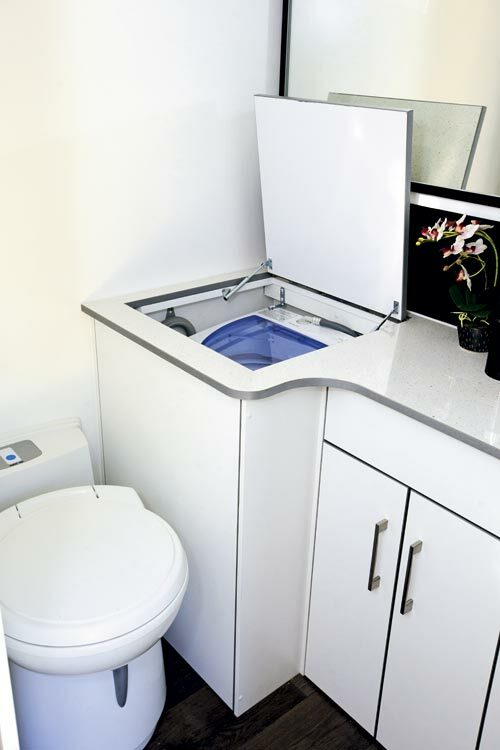 Between the dinette and bathroom is the 186L three-way Dometic fridge-freezer, with a microwave neatly fitted into the cabinetry above. 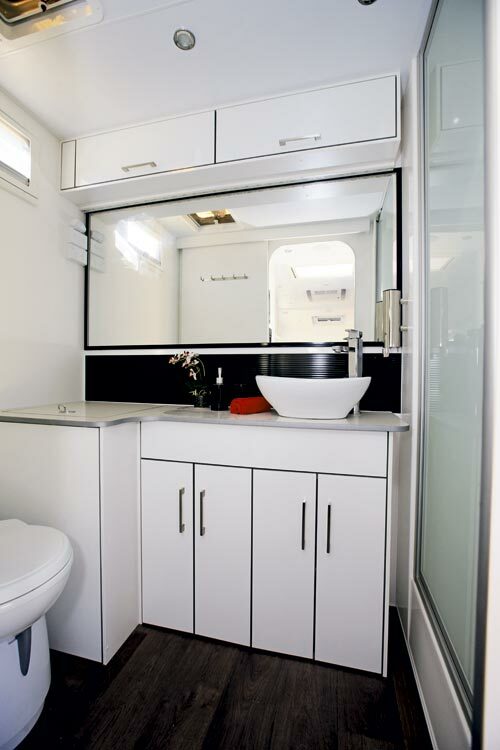 The rear bathroom is as elegant as the rest of the Commando’s interior. There’s a nearside shower, vanity, mirror, Lemair top-loading washing machine, Thetford cassette toilet and more. The fit and finish is very good but I have to wonder if the shower door could do with better catches. As it is, there are two small plastic catches to keep the door closed. But considering the rough terrain that this van is likely to traverse, and considering how quickly a shower door will open and break if unsecured (I’m speaking from experience with another van – a sad tale), I reckon something more solid needs to go here. 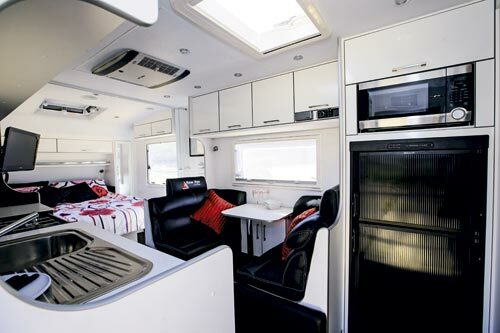 The Commando boasts a dazzling array of LED downlights – I counted 14 in the main cabin alone! And I really liked the 130mm-high checkerplate kickboard at the bottom of the cabinetry throughout. Like the many stoneguards on the outside, the kickboard is a reminder of the thought that’s gone into making this van fit for its purpose. Rugged, resilient, reliable. Forgive the alliteration, but these were the words cycling through my brain as I towed the Commando along the rough tracks, bumpy secondary roads, and smooth bitumen highways of the Blue Mountains. You’d expect a certain quality, considering the Commando’s price tag, and New Age has pretty much gotten the formula right with this one. Clearly, this van is all about remote touring without leaving the comforts behind, and in this regard, the Commando stands to attention. 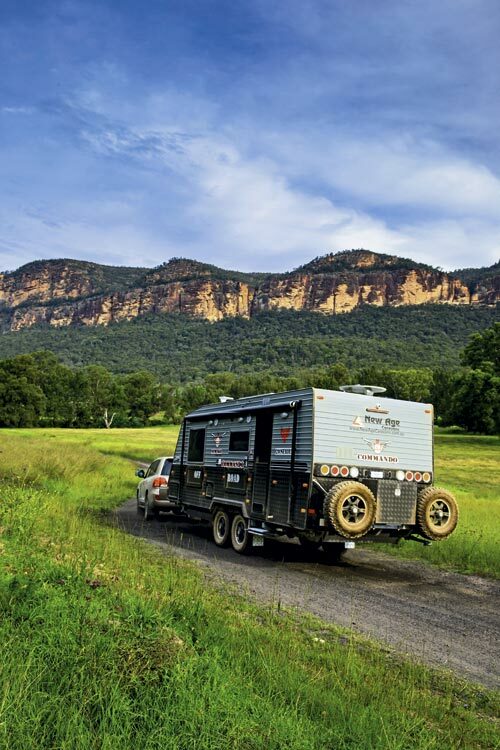 True offroad caravans – rigs built to tackle the likes of the Great Central Road and the Gibb – require special equipment, gear built to handle the worst that comes your way. 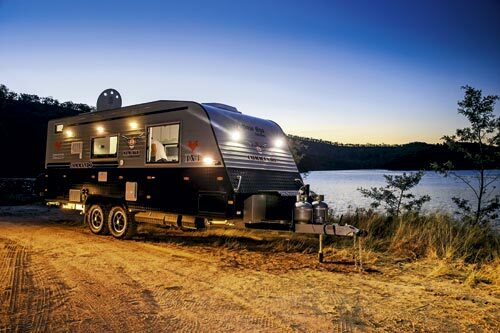 In its original form, the Hitchmaster D035 – engineered and manufactured by Vehicle Components, Qld – was launched in 2009, following the success of the D025. 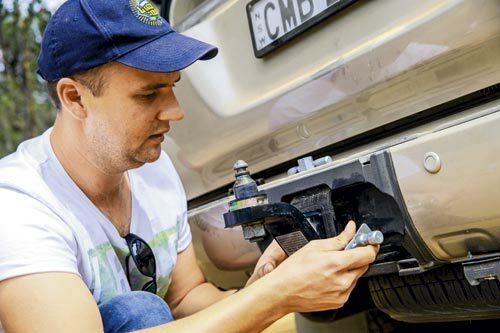 The 3.5t-rated hitch was field-tested in Cape York by the VC crew (who make a habit of torture-testing all of their new products) and the latest version of the DO35 improves on its predecessor by providing a protective polyurethane collar, a permanent dust cover, and an upgraded double-locking mechanism. 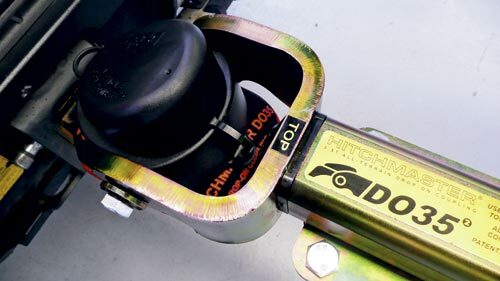 Complying with Australian Design Rules 62/01 and 62/02, the D035 V2I drop-on coupling (fitted to our Commando) also has a polyurethane bush on the pin and a safety cap doubling as a visual aid to ensure the locks are engaged, and an integrated handbrake. It features 360-degree rotation and 70-degree articulation, and during our test it was as happy on the blacktop as it was on rugged tracks. Because of its low profile, the coupling provides excellent rear door clearance, which, we’re told, has proven popular with new-Pajero owners, considering the position of this vehicle’s spare wheel! As traditional towballs, to some extent, self-guide into the coupling, I expected lining up the narrower pin (provided as part of the D035) with the coupling would require some precise reversing! As I discovered, though, it’s really no more difficult than lining up to a ball coupling, and after doing it a couple of times, I was an expert.